I held my breath as I weaved around and through the densely packed Calle Betis bar in Seville. I arrived late to their flamenco show and I had just spied an empty place on the floor in front of the stage. I was eager to see flamenco dancing. I knew that no amount of YouTube video clips could compare to an actual real-live show and, from what I’ve heard, the Andalucian style of flamenco was not one to be forgotten. The bar was buzzing with people; eating tapas, drinking, chatting with friends. The waiters continually had to re-make pathways between tables as they passed through the restaurant. I sat at the front of the stage as I let the sounds of the humming crowd flow over me. Soon, the guitarist, singer and dancers all approached the stage and the buzzing died down. A soft, flowing, haunting ballad began on the guitar and the last rumbles of the crowd grew quiet. There was a breath of silenceand the singer began belting a song, feeling every note and every word throughout his body, his face twisting with expression. After a few moments, a flamenco dancer came out in the middle of the small stage. Her movements were strong, slow and somber, her back arched as she captivated the audience. An intense emotion stung her like an electric shock and she flung her arms above her head, only to have them slowly and gracefully twirl above for a few moments. It was as though she was dancing in molasses- each movement deliberate and driven with intensity. The guitar started playing a louder, faster beat and the singer cried even louder. Her fellow performers started clapping and stomping (their feet and hands keeping two different rhythms) to the raucous beat as her movements grew quicker and more gracefully wild. The beat grew stronger, louder and the crowd started shouting and clapping along. It was as though the entire bar- performers and audience together- had been possessed with this passionate and lively rhythm. Her routine ended with lightning fast footwork, the intensity reaching its highest peak. The bar filled with cheers and clapping as she twirled back to the side of the stage. I’ve been dancing for 18 years and I have never heard something quite like the flamenco beat before. There is a passion and emotion throughout that is not seen in other dance forms. The culture flamenco dancing is fascinating and mysterious, going far deeper than its sometimes stereotyped image. Flamenco is comprised of four elements: cante (voice), baile (dance), toque (guitar) and jaleo, which more or less translates to “hell raising.” This last element, with its passionate freedom, includes clapping, stomping and shouting from the crowd and fellow performers. The palmas, or handclapping, is made up of intricate rhythms accompanied by an equally intricate set of stomping and footwork. I’m no stranger to musical beats andrhythms, but after a few minutes of trying to figure out the flamenco beat during the performance, I gave up, worried that my head might explode if I tried any longer. One of the most alluring elements of flamenco dancing, beyond the rich, passionate taste of Andalucian culture, is duende. This element can be described simply as “the soul force that inspires flamenco art.” For many years writers, such as Federico Garcia Lorca, have given duende a spiritual and mysterious significance, something that can’t easily be understood or felt by the average person. It is said that duende can only be experienced in certain intimate flamenco settings. During these performances, “a singer will be possessed by the dark tones of the song and the spirit will enter the mind and soul of anyone who opens up to it.” The artists are seized by this supernatural inspiration and it creates an intense expressiveness felt in the performers and the crowds watching. 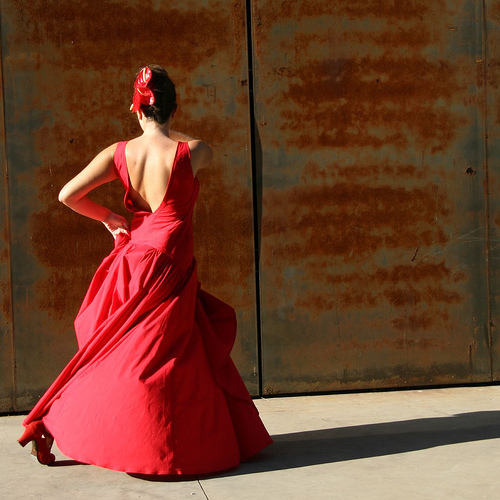 Flamenco is not something to be missed when experiencing Andalucia. But it is best seen in a more traditional setting: a crowded bar, full of locals eating tapas, drinking and socializing. And having to squeeze your way to the front of the stage where you experience an unforgettable display of passion, creativity and a little bit of duende.